Calculating how short-length cinema might set about to examine the experience of a tree that plays out in year-long cycles, this 24-minute study experiments with polylinear construction and polytemporal scaling of sound and image that were recorded during one 24-hour slice of street life in the span of a city block. 8K video (7680×4320) with 5.1 mix has been downsized to HD (1920×1080) with LtRt audio for this preview. 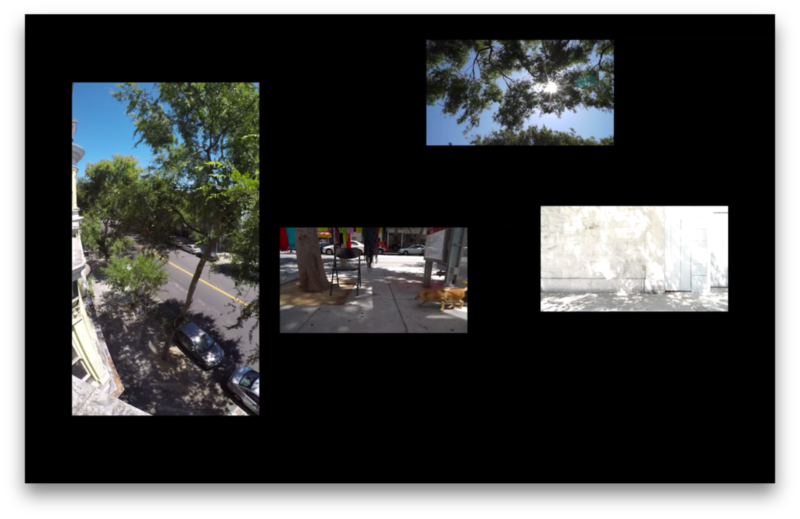 THE SOCIAL LIVES OF URBAN TREES is work-in-progress name for an experimental video project that merges environmental sensing with observational cinema techniques—inventing a cinéma vérité approach that takes cues from revelations that emerge from ongoing data capture. 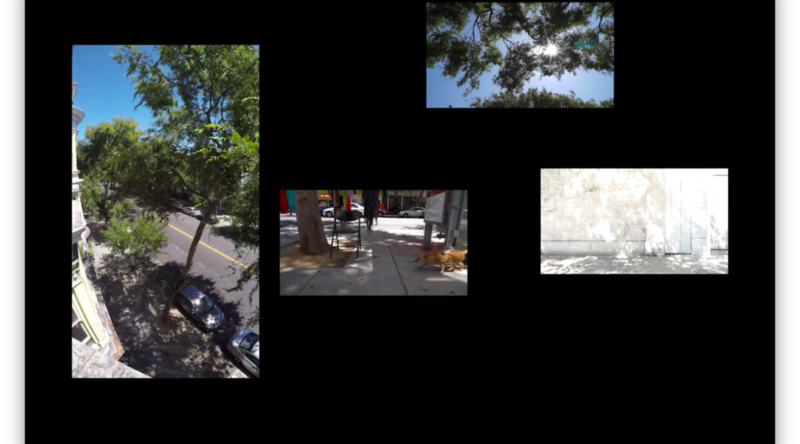 A series of video portraits of San Francisco street trees will explore the forms and qualities of public spaces created by individual trees, while using small programmable cameras and sensory apparatus to visualize and listen to the trees’ own perspectives regarding their environments and various other inhabitants with whom they share the territory. In the course of the project, techniques were devised to capture and present actual synchronized production sound for time-lapse visuals. This is most clearly audible at the beginning and at the tail end of this video. It was discovered that multiple-timescale audio of particular events made the presentation more accessible. An example is the car-departure between 2:00 and 2:10. Actual production sound of this moment was placed into the edit at different timescales, and edited to produce an impression of “time-compressed car departure” whereas the actual 60x timecompression sounded more like a clik. While it began as a piece about the trees specifically, during the audio editing and mixing process, which ultimately included several additional field sound gathering sessions to the location, it became a kind of study of the soundscape of this particular intersection: 24th and Folsom Streets in San Francisco’s Mission District. You could listen without watching… I won’t tell. Infrastructure Soundworks examine the hidden works and underpinnings of the Industrial Antrhropocene era, primarily through the physicality of sound. As of 2018/2019, preliminary material and exploration is being made for a piece about the end of coal. 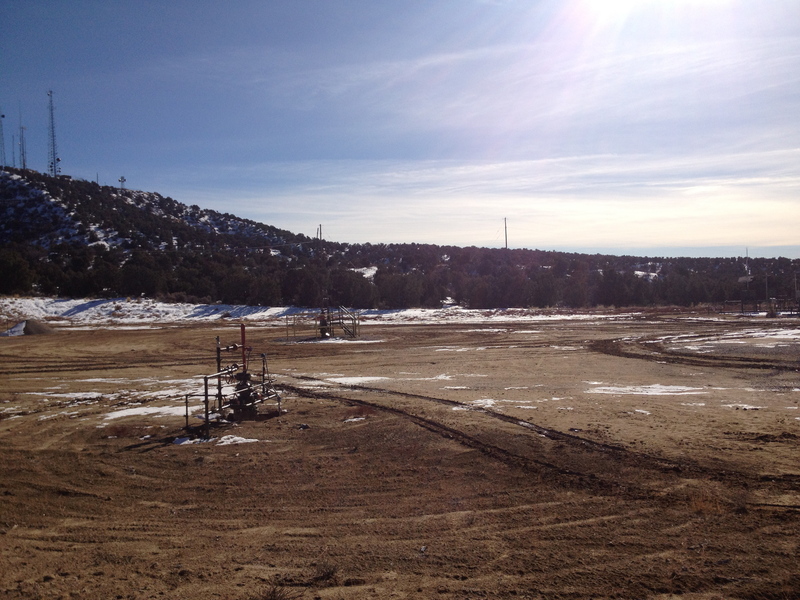 “Oil and Gas” is one such sonic journey through desert landscapes of fossil fuel production, composed of field recordings made in the shale gas fields of the San Juan and Green River Basins of Colorado and New Mexico. These lands are an epicenter of fossil-fuel extraction for the present and the near future, and are positioned as strategic energy resource for energy security for the United States. 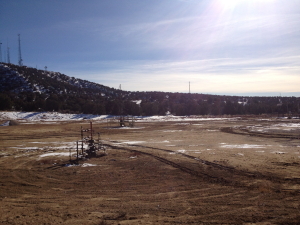 A wilderness filed with machines, vast areas of remote high desert territory are spiderwebbed with access roads, pipelines and wellheads. All this industrial infrastructure is what makes possible an energy-use profile unprecedented in the history of life on earth. We turn our ears toward this infrastructure, to better understand ourselves within the world. 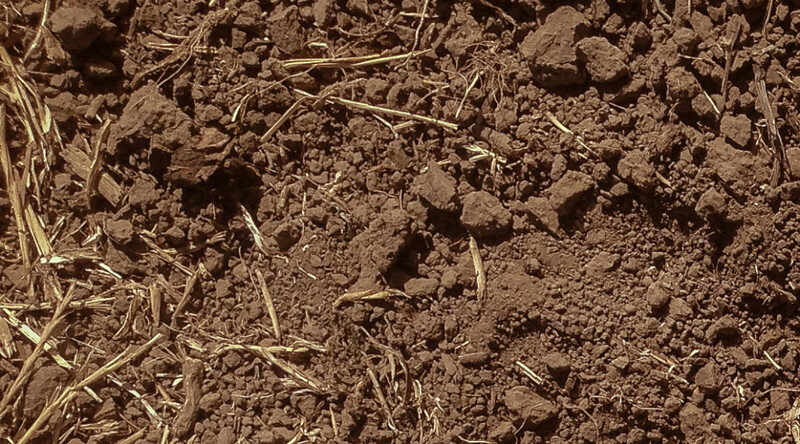 This is a subset of, an extension of, and an alternate direction for the material from Listen Toward the Ground, an audio tour formatted piece which was shown at ISEA2012. I joined Jim McKee and Joan Jeanrenaud in realizing the soundscape for Doug Hall’s large-scale video installation Chrysopylae. 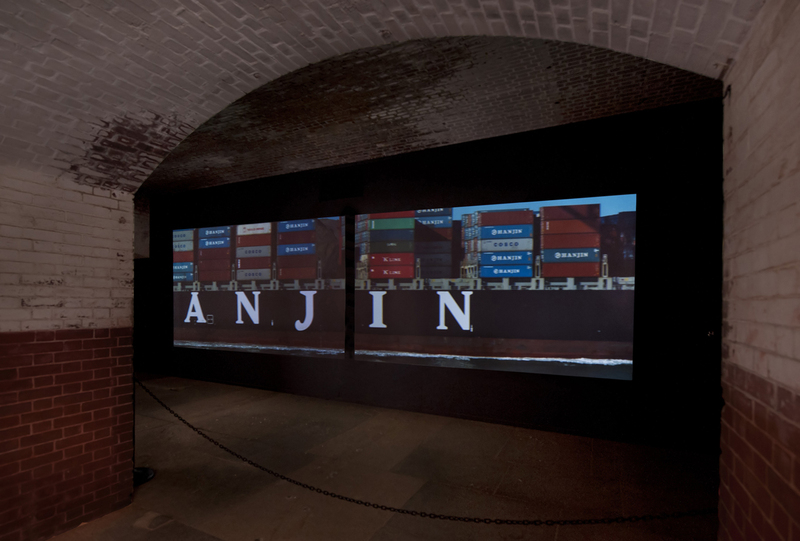 Chrysopylae is a double video projection that was commissioned by the For-Site Foundation for its exhibition International Orange (May 24 – October 28, 2012). 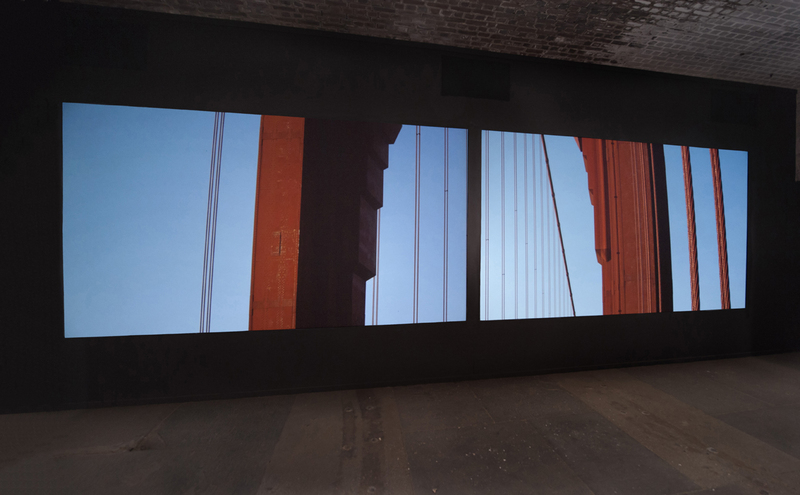 The exhibition included the works of sixteen artists and was part of the 75th anniversary celebrations of the Golden Gate Bridge. 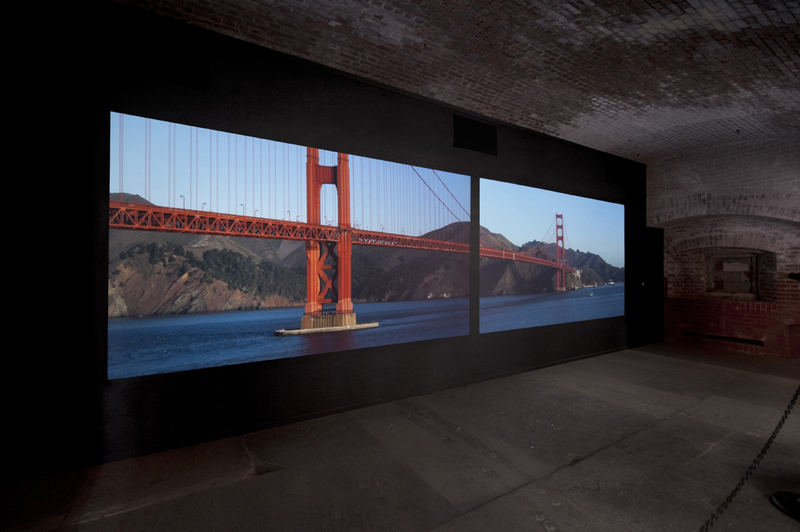 All of the projects were installed at Fort Point, the historic 19th century fort located beneath the southern span of the bridge. Chrysopylae (Greek for Golden Gate) was the name given to the straight between San Francisco and the Marin Headlands by the explorer John C. Fremont in 1846. 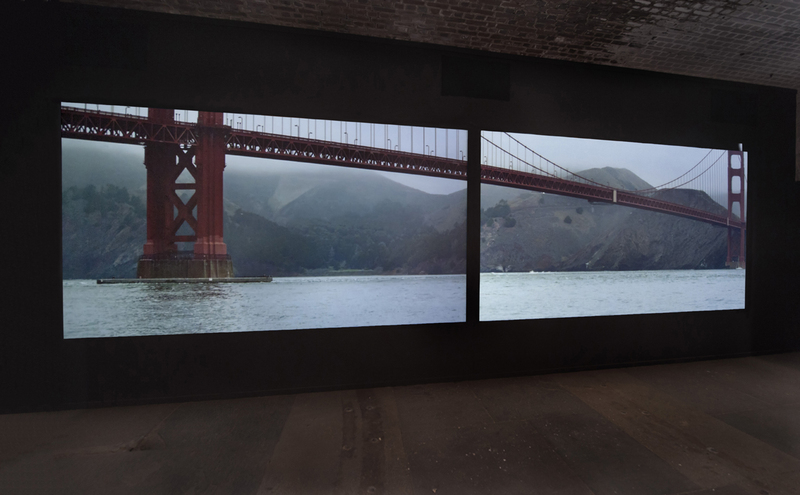 The video was shot with two HD camera that were synched to one another, allowing for the creation of large, two-screen panoramas. 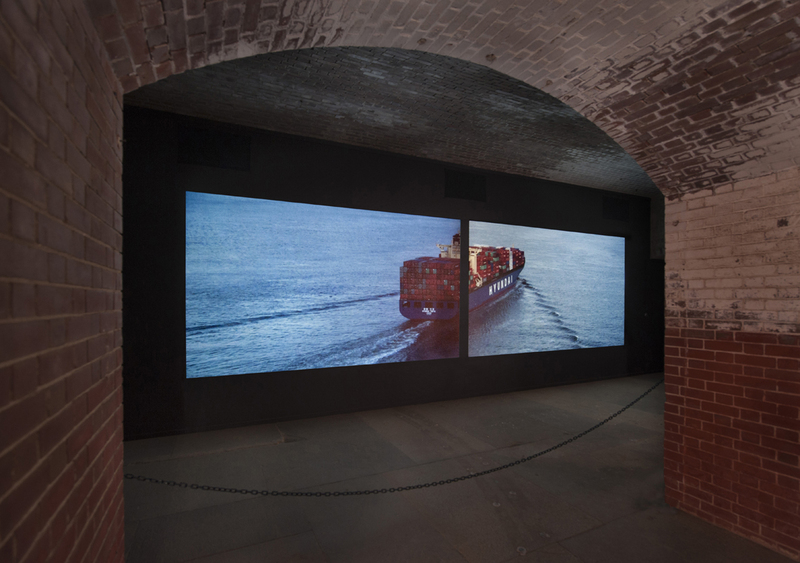 The video focuses on the bridge, seen over time and under differing weather conditions, and on the immense container ships that pass beneath it every day. The two synchronized projections (6’9″ x 12′ each) loop every 28 minutes. Mixing Chrysopylae at Fort Point. It was cold. The sound track was composed by Jim McKee and Joan Jeanrenaud, with sound design and additional composition by Jeremiah Moore. The project was produced by Starr Sutherland. Recording sessions took place at Fort Point, Jim’s North Beach studio, Joan’s home, and my Lower Haight studio. Mix was completed on site. Playback was via a very satisfying 3.1 Meyer UPJ system with cardioid subwoofer array. In 2013 San Jose Museum of Art hosted a version with 5.1 channel mix. Listen Toward the Ground is a site-specific composed soundscape work, intended for listening to while walking a defined route. 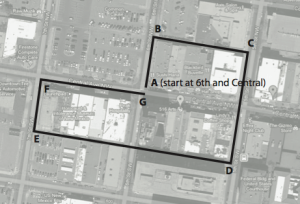 Using headphones and a voice-guided tour format, it superimposes a recorded and composed soundscape of oil- and gas-field infrastructure onto the soundscape of downtown Albuquerque New Mexico. Drifting fragments of voices knit the personal side of oilfield life into the industrial. The usually unseen and unheard landscape of energy extraction is brought into parallel with the daily world in which we live our lives. 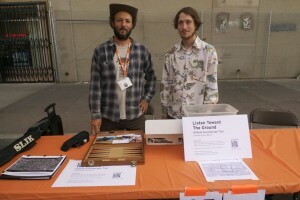 At ISEA2012, visitors could check out a sound player and headphones and take the self-guided walk. 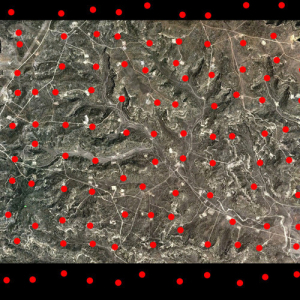 Aerial image of oil and gas fields of Northwest New Mexico. 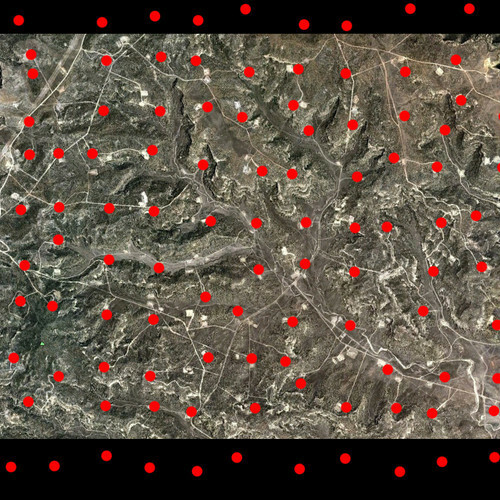 Wellheads marked in red. The sound in this video consists of the program audio, overlaid with audio recorded during the video shoot of the walk. Headphones or quality speakers recommended. The concept was originated for as-yet undeveloped GPS-driven show-control format, allowing the walk to be guided without the vocal signposting. The walk begins at the Northeast corner of Sixth and Central. Go there and press play. 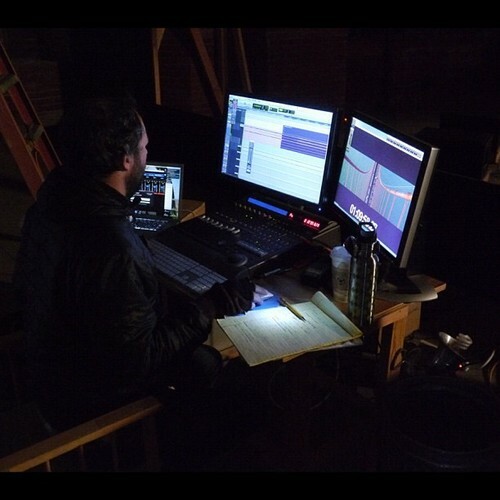 Concept, sound design and composition, recording and mix by Jeremiah Moore. The recording contains musical improvisation by Friends of the Tank: Max Bernstein, Mark McCoin, Jeremiah Moore, Bruce Odland. The Tank is a developing sonic arts space in western Colorado, learn more at tanksounds.org. 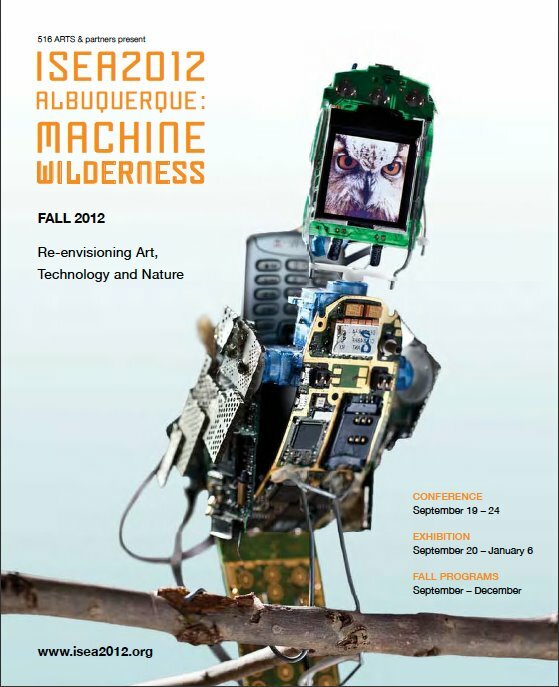 Created for ISEA2012 Machine Wilderness, the convention of the International Symposium on Electronic Arts. 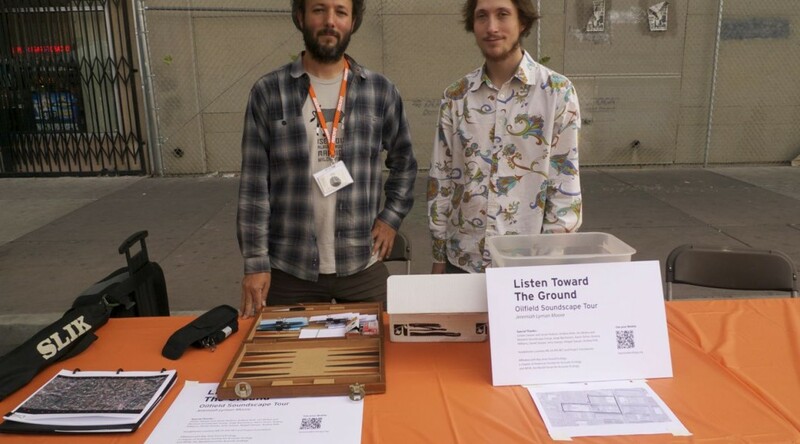 Thanks to 516Arts and Bay Area Sound Ecology. Thanks to Jordan Sawyer and Jessie Hudson, Andrew Roth, Jim McKee and Moment Soundscape Group, Jorge Bachmann, Aaron Ximm, Andrea Williams, Daniel Sawyer, Jerry Sawyer, Abigail Sawyer, Andrea Polli. Headphones courtesy ME-DI-ATE.NET and Project Soundwave. 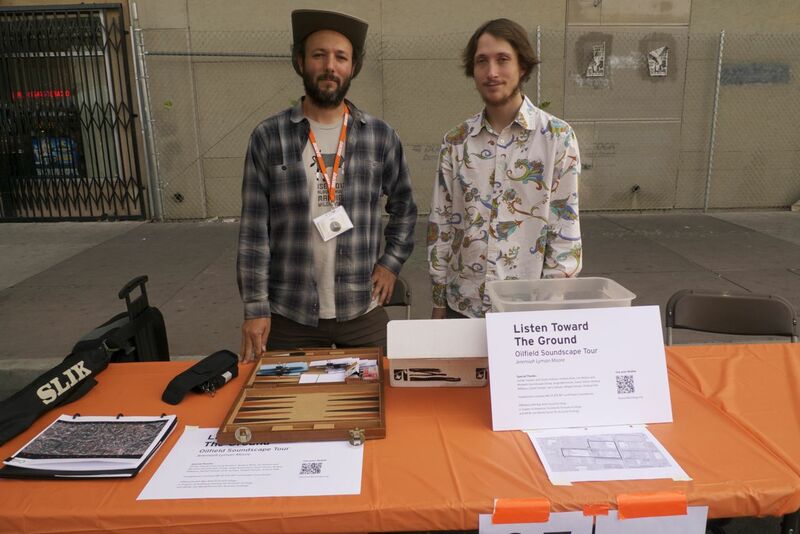 Affiliated with Bay Area Sound Ecology, a chapter of American Society for Acoustic Ecology and WFAE, the World Forum for Acoustic Ecology. 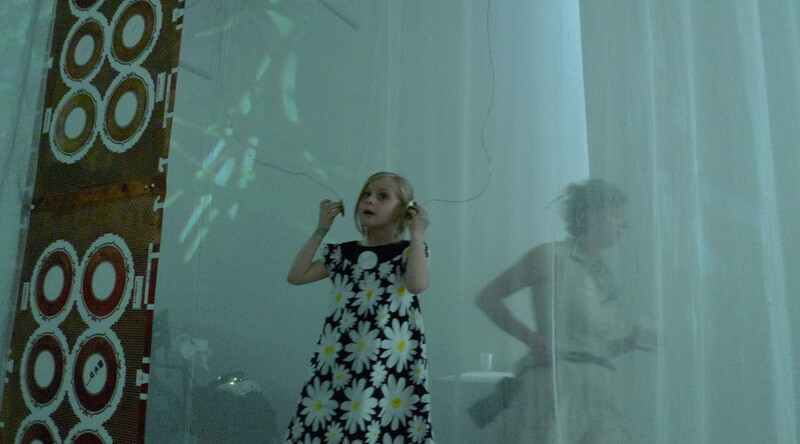 Food Safety Enhancement is sound piece, a soundpoem of sorts, commissioned by dancer/choreographer Rowena Richie. It was created as a kind of personalized response to a piece of legislation which was being discussed a lot in the spring of 2009 – the Federal Food Safety Enhancement Act – and in particular a part of it which some were calling “Scorched Earth” – which promoted the idea of creating “Sterile Buffer Zones” around farmer’s fields. But really the piece is about disconnects: About technocracy trying to regulate the interstice where commerce and industry meet growing things. It ended up taking this fragmentary, internal narrative sort of form, hinting at internal imagery and confusion at the information in the news. Slow and gently crossfading images projected onto a large spiral of diaphanous fabric, drifting from a rotating tree-trunk bark-scape to a daydream of gold-green flowering branches wafting in breeze. Sound of urban beehive activity, filtered so that the bees themselves are nearly absent. Followed by a soundscape of distant crickets and electrical wires in mist, punctuated by the violent and banal passing of a minivan speeding through the landscape. A small bench awaits in the center of the spiral, a place to sit and listen to small, naked speakers dangling from wires, playing heavily processed and edited bird recordings. At the center of the spiral, a “trunk” is formed of discarded etched panels, bright copper on white fiberglass. A wicker garden bench is positioned outside the spiral, so one might sit and regard the spiral as one might regard a garden. In making it, I was thinking about the relationships and interfaces between humans and nature. As beings who regard ourselves as beings, we can see ourselves as part of nature or as outside of it. 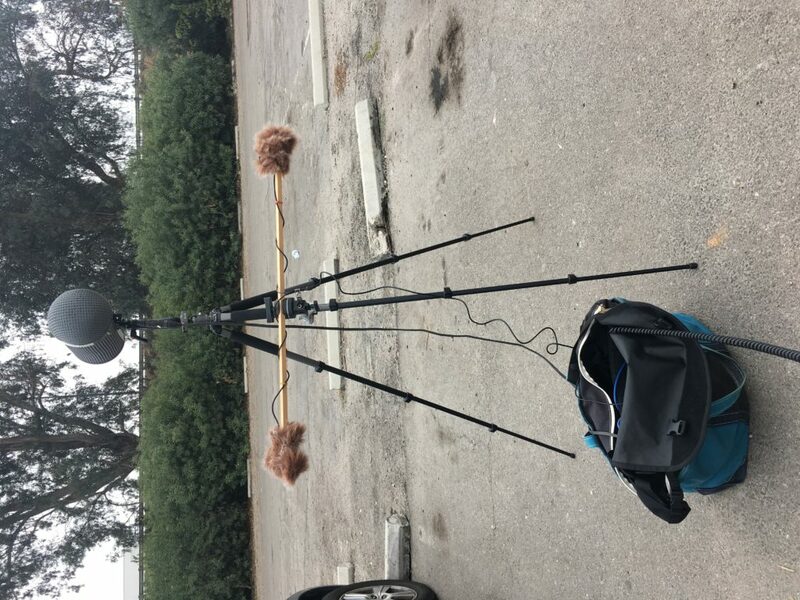 Four audio channels derived from field recordings of urban wildlife in San Francisco’s Mission District and environs. 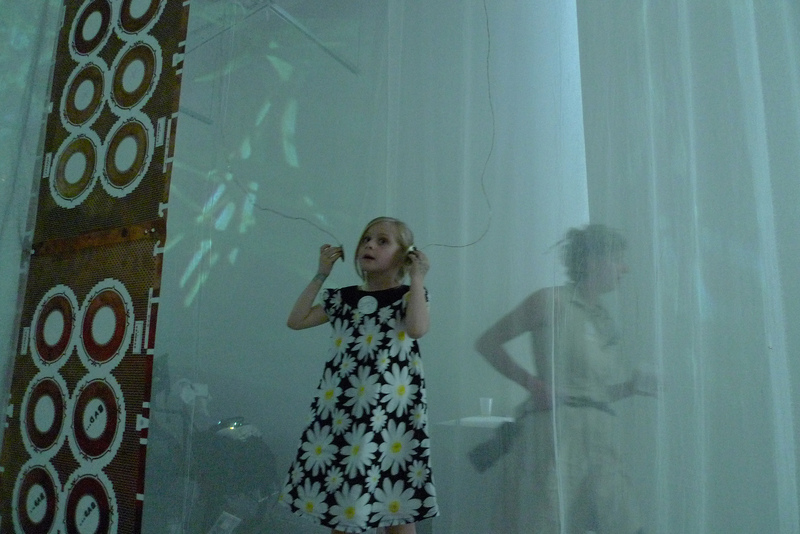 Materials: Fabric, Video, Sound, Benches, Speakers, Space, Circuit Boards. 18′ x 25′ and 11′ tall. 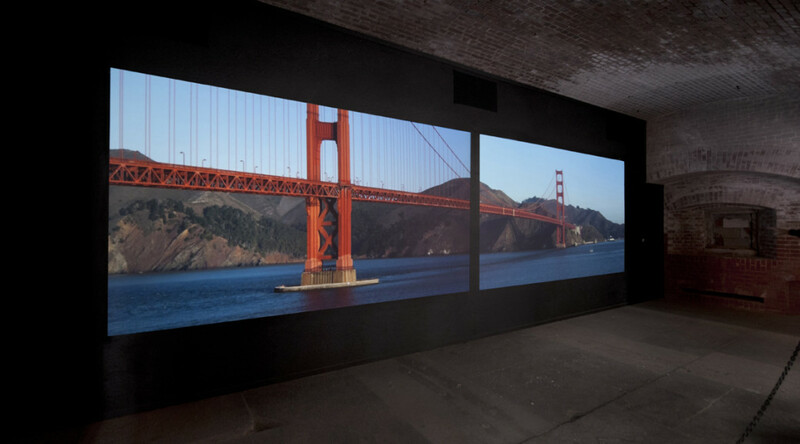 This video is a four-minute walk through the gallery space. 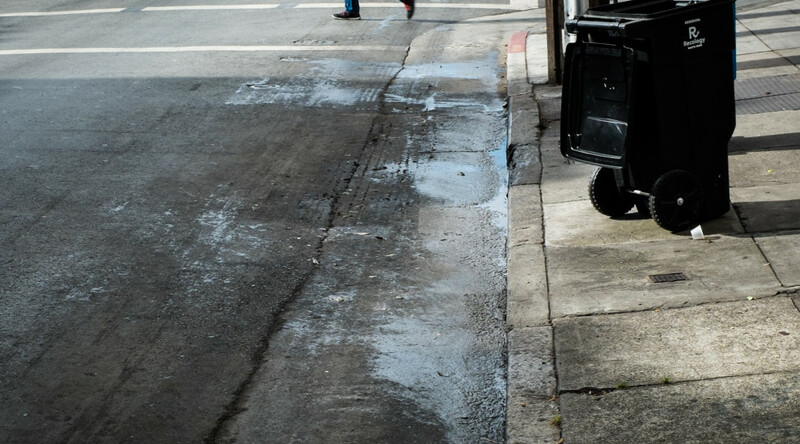 A sonic exploration of the overtone series of San Francisco’s mechanical street sweepers, this piece was performed live on Simon Lee’s Bus Obscura as it drove through the suburban town of Dublin, California. It is part of a thread of work uncovering beauty in the everyday. Our first child was born april 20, 2003. 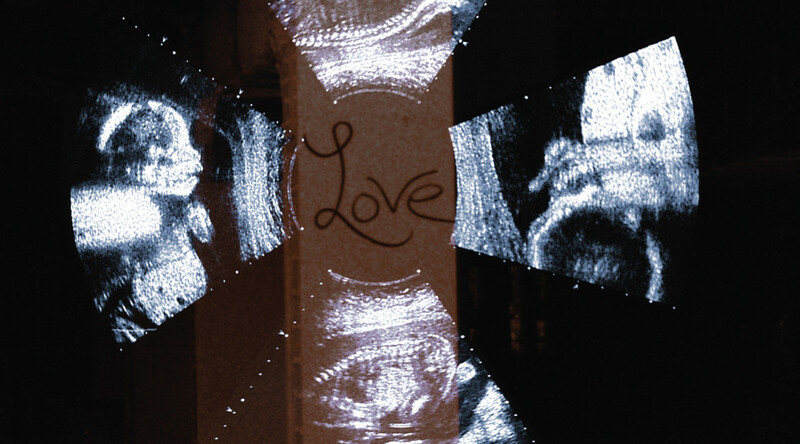 I set out to imagine ways in which the baby hears inside the womb, and make a tapestry out of those imaginings using everyday living sounds as material… Dreaming an image of these familiar sounds as lullaby. His heartbeat is a keynote, recorded by patching into an ultrasonic fetal heart monitor, threaded into driving over expansion joints on the 101 freeway. Headphones or high quality speakers recommended. DeFused Ads are short abstract films which use television commercials as their sole source material, transforming them from commercial messages into meaningless things of beauty. Defused Ad no.2 is made from a TV ad for an indy 500 style racetrack. The hard-hitting voiceover is now a drifting chitter, and the screaming racecars are now soft colored blurs. 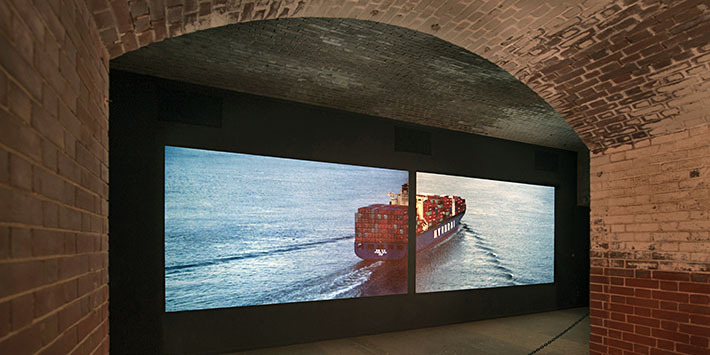 The technique involves “averaging” the texture, color and tone of the original material into luminous drifting masses. The original fast-cut promotional message is transformed into a slow-time mode. No edits were made, the processing simply acting as a lens to distort time and space. DeFused Ad No.1 is a luminous, ambient electronic landscape made from an interstitial cable-TV promo. At the time, my job was working in a recording studio in Denver which did a lot of commercials. I myself was engaged in the craft of perfecting these short mass-media messages intended to incite an audience to partake in commercial transactions. I started to think about how, in a way, television ads are some of the high-art of our civilization: the most refined, concentrated, compelling experiences that can be created in sound and light. Eventually the obvious connection was made: to absolve these messages of their meaning, rendering them objects of pure beauty.